Hello! I am extremely honored to be a part of the Wayne State University family. Our superior research and academic programs are second to none and nationally recognized among fewer than 3 percent of universities nationwide with the Carnegie Foundation classification of RU/VH (Research University, Very High research activity). Centered in an urban environment, Wayne State's community is diverse and rich in culture and history. Our students and graduates are leading the way thanks to a world-class faculty, a fully committed leader at the helm, and solid community and industry partnerships. It's a great time to be at Wayne State and in Detroit. I look forward to many pivotal moments to come in this remarkable institution's future. Jacqueline Wilson is a former energy consultant for Schneider Electric, a global leader in energy management. She also spent more than two decades in corporate sales for AT&T and WorldCom. Now, with the support of her husband M. Roy Wilson, and others, Jacqueline Wilson is championing the cause of homelessness at Wayne State and in Detroit. She serves on the Women's Advisory Council for Congresswoman Brenda Lawrence, representative of Michigan's 14th District. Mrs. Wilson is also on the Samaritas Advisory Council, where they recreate connect people to communities and families. Additionally, Jacqueline Wilson serves as a member of the YMCA of Metropolitan Detroit Board of Directors, which is a non-profit organization dedicated to strengthening the foundations of community. Jacqueline Wilson established the HIGH (Helping Individuals Go Higher) Program with a mission to ensure no student abandons their dream of earning a degree solely because of housing or financial challenges. The HIGH Program provides resources for students in need, such as housing support, textbooks and other school supplies, clothing, transportation, and child-care assistance. Listen to the First Thought podcast with Jacqueline Wilson, the First Lady of Wayne State University and Founding Director of the WSU HIGH program. Beginning February 18th you can listen to the podcast weekly with new episodes airing every Monday on Apple Podcasts, Youtube, and Spotify. The Detroit Pistons may have won in their face off against the Memphis Grizzlies 100-93, but the real winner of Wayne State Night at Little Caesar's Arena was the HIGH Program. The HIGH Program and other youth-serving agencies in the area were invited by Detroit rapper Big Sean as he returned to his roots last month for a conversation about youth economic mobility, the 2020 census, and more. Happy Birthday video to First Lady Jacqueline Wilson. In loving memory of Cliff Russell may he rest in peace. Held throughout the state of Michigan, Warrior Day activities — offered through the Office of Undergraduate Admissions — provide an opportunity for prospective students to learn more about Wayne State and engage in planned activities. The HIGH (Helping Individuals Go Higher) Program helps financially stressed students at Wayne State University reach their goal to graduate. First Lady of Wayne State University and Founder of the HIGH Program appears on this edition of Newsmakers Extended. 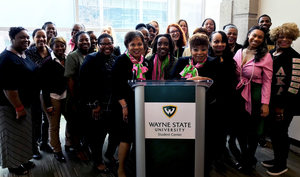 First Lady Jaqueline Wilson's Helping Individual's Go Higher (HIGH) Program collaborated with Alpha Kappa Alpha (A.K.A) chapters; Pi Tau Omega Chapter of Southfield, Michigan and Alpha Rho Omega of Detroit, Michigan to present a Mid-Day Workshop. The event was held from 10:00 a.m. - 12: 00 p.m. on Wednesday, April 25, 2018 in Wayne State University's Student Center where local organizations, staff and students joined the panel discussion. "The event made me want to improve things about myself that I thought were perfectly fine. It was very enlightening," said, Jasmynn Brown, a participant. The workshop entitled "Putting it All Together" successfully informed the attendees on how to meet personal goals regarding finances, fitness, education and job opportunities. Upon arriving at Wayne State, President M. Roy Wilson and wife Jacqueline were quickly confronted with the oft-obscured issue of student homelessness and housing instability. Not too long after arriving on campus, the First Lady had a chance encounter with a medical school student who, she learned, was living out of his car. She decided then that something had to be done.